How can you help students make “level” gains? How can you help students gain the skills they need to reach their goals? How can you help students stay in programs long enough to meet their goals? How can you prepare and retain good teachers? How can you document the successes of your program? 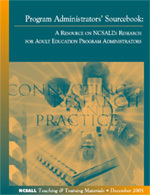 The National Center for the Study of Adult Learning and Literacy (NCSALL) has conducted research relevant to these questions. This Sourcebook is designed to give you, as a program administrator, direct access to research that may help you address the challenges you face in your job.